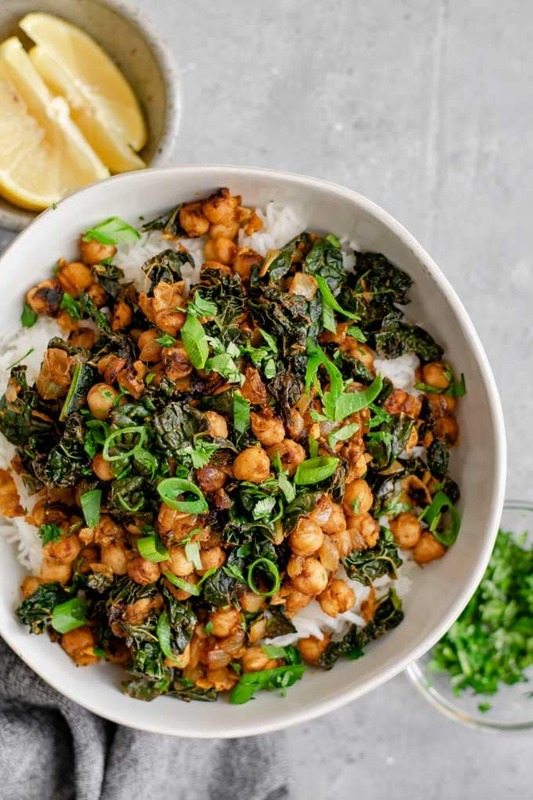 This chickpea and kale recipe was originally one of those meals. We were at home on our last night before a short trip, and had a big beautiful bunch of lacinato kale to use up. Omar was working, and I needed to get dinner made quickly so I could move on to other chores. It was literally me throwing things I had to use up into a pan, including 2 half-used onions from the fridge, one red and one yellow. I didn’t even decide to use Indian spices until halfway through cooking. So, you can imagine my surprise, when we finally sat down to eat that we were blown away by how delicious it was! 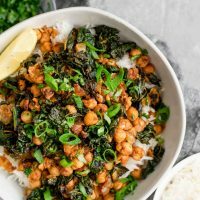 For what started as a clean out the fridge kind of meal, it made a ton, was ready in around 30 minutes, had super pantry-friendly ingredients, and was seriously good! It had an impressively short ingredient list and only used 5 spices (which, for Indian food is few.. though that’s cheating a bit because garam masala is technically many spices, haha). I knew that I had to recreate it ASAP to share with you (and eat more myself)! Lightly caramelized onions are sweet and flavorful, and provide the base of the dish along with a healthy dose of minced garlic. 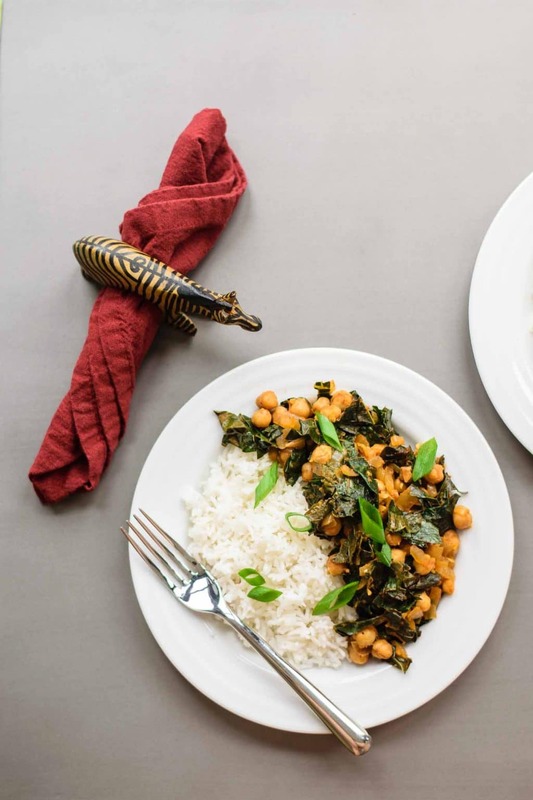 Garam masala is the main spice [mix], and is combined with turmeric for color and it’s pungent flavor, aromatic coriander, earthy cumin, and some cayenne for a kick. I add the full amount of cayenne for what I consider a mild heat, you can add even less for the most subtle spice, or even more if you want it nice and spicy! Alternatively, you can add some fresh chili along with the garlic for spice. 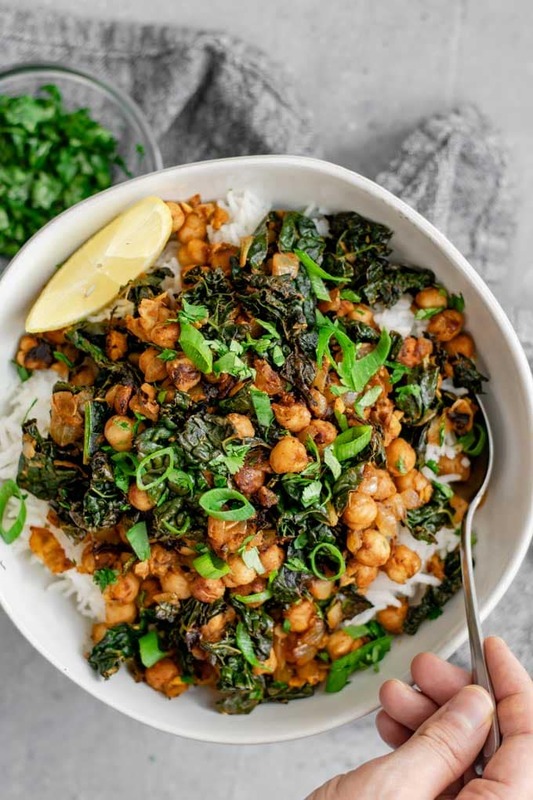 Salt enhances the spices and rounds out the flavors of the dish–if you’re ever cooking Indian food and you feel that it’s lacking in something, try adding more salt. Tomato paste is tangy and umami-rich and adds some bold flavor to the curry (or, as I grew up calling it, subzi). Lastly, and possibly most importantly, an entire lemon’s worth of fresh citrus juice is squeezed into the dish. It brightens the flavors, highlights the saltiness (so, don’t adjust the salt until after you add lemon! ), and generally makes the entire dish POP. We ate these Indian spiced chickpeas and greens with basmati rice and a healthy addition of my homemade hot sauce. An Indian pickle (achaar) or chili sauce would have been nice as well. I enjoyed this dish so much I was glad to eat it half a dozen times over the course of a week. 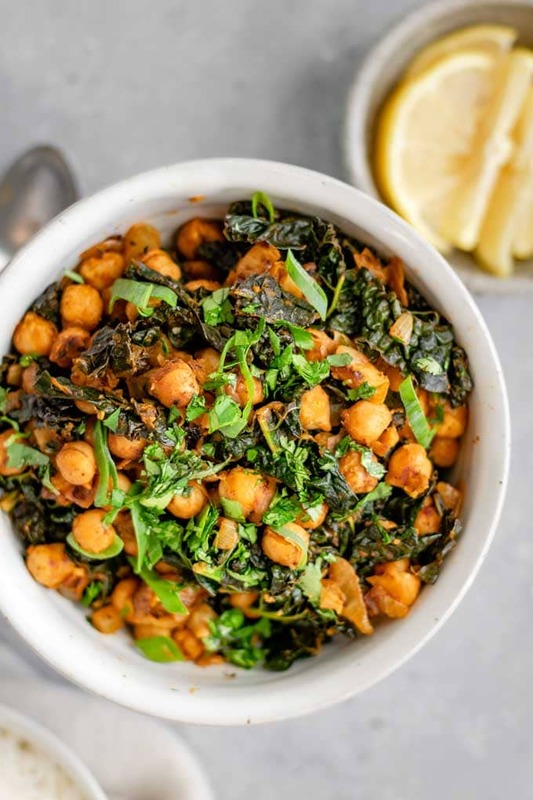 If you make this Indian spiced chickpeas and greens, leave a comment below and rate the recipe on the recipe card. And please share your photos with me on Instagram, tag @thecuriouschickpea and #thecuriouschickpea. I love seeing your recreations! I used lacinato kale, but can substitute another green leafy vegetable if you’d like. Beyond the obvious curly kale (which I avoid buying because I’m lazy about washing it), chard or collard greens would be nice, and of course spinach. If you’re missing any of the spices (besides the garam masala), I would still make the dish, just add a bit extra garam masala to compensate and understand it will taste a bit different! PS you can make garam masala from scratch if you can’t find it/want a fresher (better) spice mix. This is a dry curry. If you want a saucier one, add some water or coconut milk, or try it with some fresh or canned tomato. 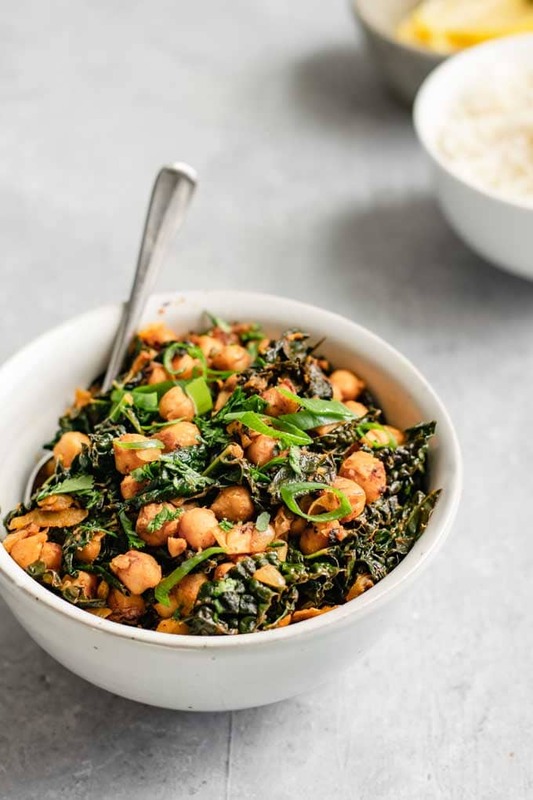 This recipe for Indian spiced chickpeas and greens is a quick and easy dry curry. 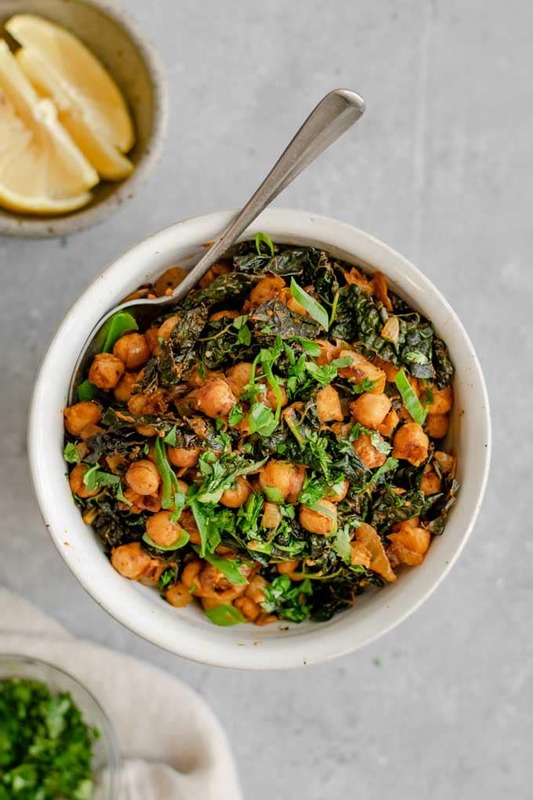 It's delicious with kale or whatever greens you have on hand! Pantry- and weeknight-friendly. Heat a large cast iron or non-stick skillet over medium heat. When hot, add the oil and onion and cook for 5-7 minutes, stirring occasionally, until the onion is softened and lightly golden. Add the garlic, and sauté for ~ 1 minute. 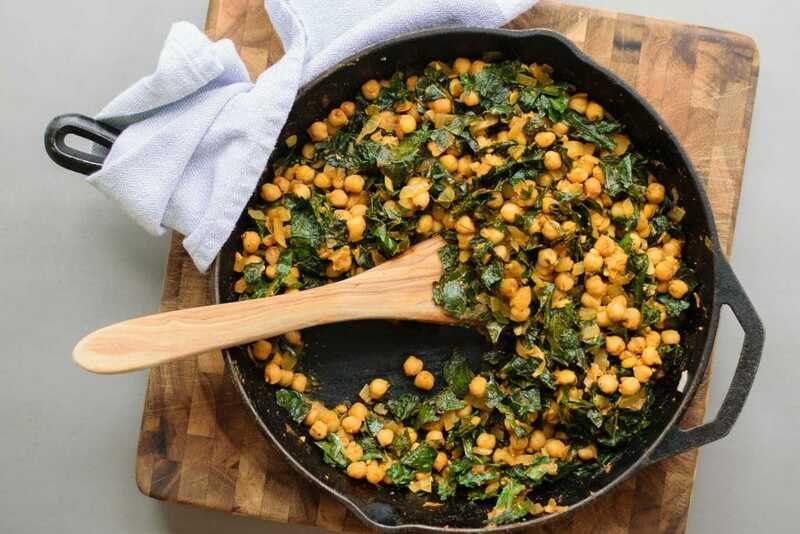 Stir the chickpeas, garam masala, turmeric, coriander, cumin, cayenne, and salt into the pan. In a small bowl mix the tomato paste with the 1/4 cup of water until smooth, then add to the pan. Cook for 5-6 minutes, stirring occasionally. Add the kale or greens of choice and a small sprinkle of salt to the pan. Let the greens wilt for about 1 minute to shrink somewhat before trying to stir them in. Carefully stir as the greens wilt to mix in fully. Sauté an additional 4-6 minutes, stirring occasionally. Add the lemon juice, and stir, cooking 1 minute. Taste and adjust seasoning as desired. Garnish with fresh cilantro or scallion greens, and serve with basmati rice, asian noodles, or Indian flatbread. Finish it off with some hot sauce, sambal oelek, or plain unsweetened nondairy yogurt or raita. Enjoy! This recipe post was updated on March 18, 2019 with new photos. 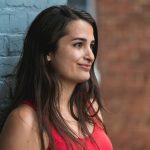 It was originally published August 1, 2017 with some of the following photos. Very easy and very yummy! Substituted pressed tomatoes for a slightly saucier feel and because I love tomatoes, and it worked. Thanks for sharing. Made this with cooked pinto beans I had on hand instead of chickpeas but otherwise followed. Delicious! Will definitely do this again. Thanks! I love that substitution! Sounds delicious!